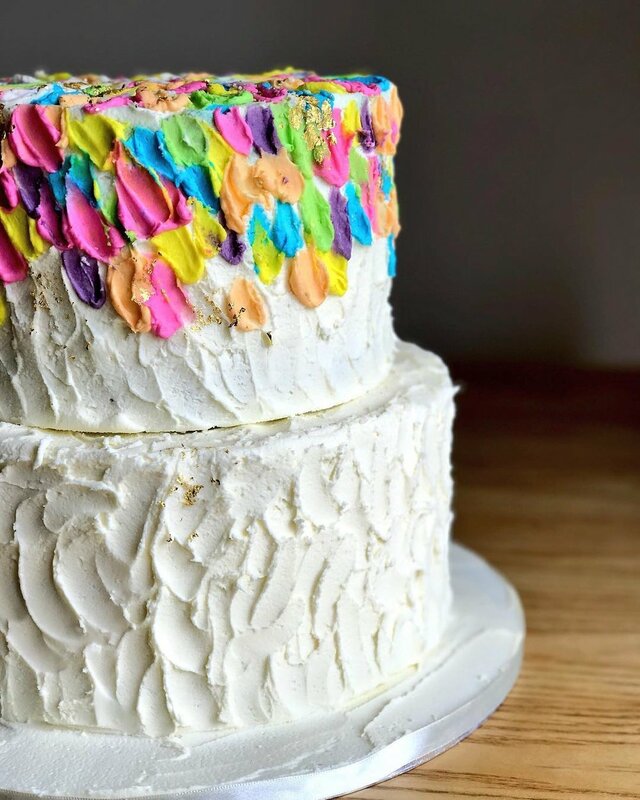 We absolutely love baking wedding cakes! It's such an exciting time for our clients and we really are always very honoured when a couple choose us to create such a special and memorable cake. We specialise in non traditional buttercream covered cakes, rather than fondant iced cakes. We offer several choices of buttercream finish including rustic, lined, smooth or rosette piping. You can choose a simple and delicious looking buttercream finish, have us adorn your cake with beautiful fresh flowers, cover it in a dark chocolate ganache drape, embellish it with gold or silver leaf, garnish it with fresh berries or even adorn it with a tiny golden snitch. Choose any of our flavours for your cake and we can make it all look the same on the outside, our clients often comment on how much their guests liked our special flavours such as our blueberry cheesecake or salted caramel cakes. Or why not surprise your guests at your cake cutting with a stunning colourful rainbow cake inside? 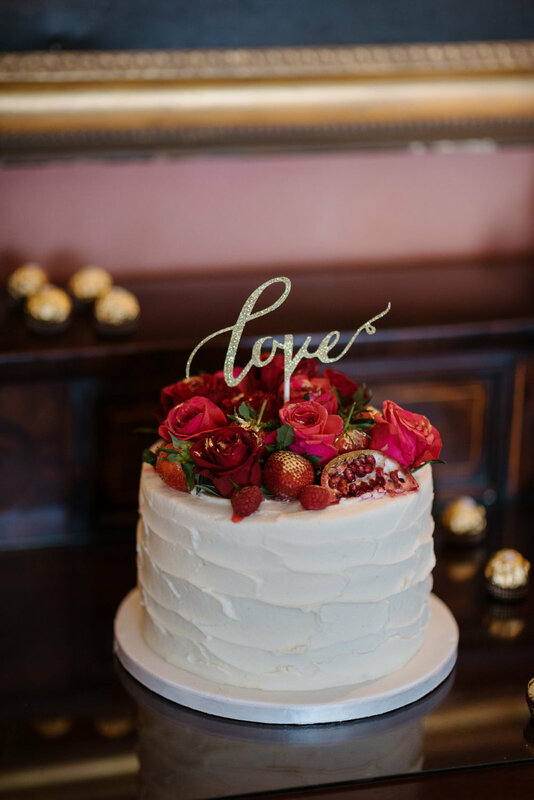 As well as our classically elegant and simple buttercream cakes we love a challenge, and we really love doing modern, non traditional wedding cakes so please get in touch with your ideas. We also offer cupcake towers in our standard or mini sized cupcakes which are a stunning centerpiece. Consultations and tastings are available by appointment only, please fill in our contact form if you'd like to talk cake! 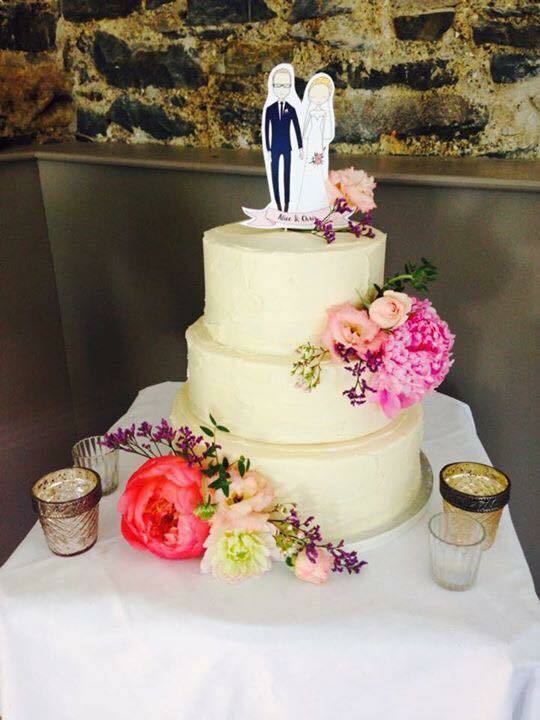 "Claire created our wedding cake for us last year and it could not have been more perfect! It was absolutely delicious and her flavours are amazing. Our wedding guests still talk about how great our cake was. Claire is a dream to work with, so lovely and accommodating and she made our experience so personal and fun." - Bride Claire, Facebook review. Photo by Fraser Stewart Photography. "Thank you so much for our wedding cake. It photographed so well, everyone was complimenting how it look and most certainly how it tasted! It was a big hit with everyone! Thank you so much for all the time and effort you put into it, it was very much appreciated"
Photo by Francis Meaney Photography.